A number of interventions are available to reduce morbidity and mortality in fetuses with intrauterine growth restriction (IUGR); but these can only be implemented appropriately with timely diagnosis and monitoring. Prenatal diagnosis of these conditions can aid in decision making concerning the timing and route of delivery, thereby reducing perinatal risk. Regulation of fetal growth is multifactorial and complex. Optimal fetal development depends on genetically predetermined growth potential, and is modulated by fetal, maternal, placental, and environmental factors (1). Fetal intrauterine growth restriction presents a complex management problem for the clinician. The failure of a fetus to achieve its growth potential imparts a significantly increased risk of perinatal morbidity and mortality. Consequently, the obstetrician must recognize and accurately diagnose inadequate fetal growth and attempt to determine its cause. Ultrasound evaluation of fetal growth, behavior, and measurement of impedance to blood flow in fetal arterial and venous vessels form the cornerstone of evaluation of fetal condition and decision making. The purpose of this document is to focus on the ultrasound evaluation of fetal growth -- intrauterine growth restriction and fetal macrosomia. The role of Doppler ultrasonography is also discussed. Abnormally small fetuses as a group have a relatively poor prognosis because some of the causes of subnormal size, such as inadequate supply of oxygen and nutrients through the placenta, chromosomal anomalies, and infections, adversely affect fetal outcome. Disturbances of fetal growth -- intrauterine growth restriction (IUGR) and macrosomia -- are associated with increased risk of perinatal morbidity and mortality. Prenatal diagnosis of these conditions can aid in decision making concerning the timing and route of delivery, thereby reducing perinatal risk. IUGR is one of the most common and complex problems in modern obstetrics. The use of the terms "small for gestational age" (SGA) and "intrauterine growth restriction" has been confusing, and the terms often are used interchangeably. For the purpose of this document, SGA will be used only in reference to the infant and IUGR to the fetus. The term initially used was "intrauterine growth retardation", but because of the stigma associated with the word "retardation", "intrauterine growth restriction" is now most often used. Intrauterine growth restriction (IUGR) is a term used to describe a fetus whose estimated weight appears to be less than expected, usually less than the 10th percentile, which is the convention this document will adopt. The term IUGR includes normal fetuses at the lower end of the growth spectrum, as well as those with specific clinical conditions in which the fetus fails to achieve its inherent growth potential as a consequence of either pathologic extrinsic influences (such as maternal smoking) or intrinsic genetic defects (such as aneuploidy) (2). IUGR has many causes, including placental insufficiency, which may be primary or due to a maternal disorder; fetal chromosomal anomalies; and fetal infections. Maternal causes of placental insufficiency include hypertension, collagen vascular disease, renal disease, poor nutrition, and drug or alcohol abuse. Viral infections (e.g. cytomegalovirus or toxoplasmosis) and fetal chromosomal anomalies, including triploidy and trisomies 13 and 18, may lead to severe, early-onset IUGR. Primary placental insufficiency is a diagnosis of exclusion, established by ruling out the aforementioned causes. It is the most common causes of IUGR. In most cases of IUGR, not all fetal body parts are symmetrically decreased in size. Typically, the fetal abdomen is small, likely a result of factors that have an effect on fetal cellular hypertrophy and possibly of decreased glycogen stores in the liver. The head and extremities may be normal or near normal in size. This pattern, however, does not always hold. Some growth restricted fetuses, especially severe, early-onset cases, are symmetrically small. This distinction has led some authors to dichotomize IUGR into two subtypes: asymmetric (or "head sparing") and symmetric. The former, and more common, variety is the pattern expected in most cases of primary or secondary placental insufficiency, and the latter is seen in cases resulting from an early insult, such as a chromosomal anomaly or infection early in pregnancy. The division of IUGR into these two subtypes, however, is an artificial one that does not withstand close scrutiny (3). The overall prevalence of IUGR must be 10%, because IUGR is defined to include all fetuses whose weight falls below the 10th percentile for gestational age. The prevalence is not uniform across all populations, however; some groups have rates below 10% and others above 10%. In a population group in which mothers are generally healthy and well nourished, IUGR occurs in approximately 3% to 5% of patients. In women with hypertension or a previous growth-restricted fetus, in contrast, the prevalence rises to 25% or higher (4). There are two essential steps involved in the antenatal recognition of growth restriction. The first step involves the elucidation of maternal risk factors associated with growth restriction and the clinical assessment of uterine size in relation to gestational age. The second step involves the ultrasonographic assessment of fetal size and growth, supplemented by invasive fetal testing for aneuploidy or viral infections in select cases. Prenatal morbidity and mortality can be reduced with prompt diagnosis of IUGR and monitoring to assess fetal well-being. Testing should be scheduled based on gestational age, current fetal condition, and evaluation of future risk. Modalities include twice-weekly serial non-stress tests (NSTs) and Doppler studies, once-weekly amniotic fluid volume measurements, and twice-monthly ultrasonographic assessments of interval growth, usually beginning at the diagnosis of a small-for-gestational age fetus. Biophysical profiles and contraction stress tests (CSTs) are reliable methods for assessing placental respiratory reserve, and should be utilized when questions arise regarding fetal condition. Their prognostic value for fetal death extends to within 7 days. Frequency of monitoring may be tailored to the individual fetus. Umbilical artery Doppler studies can be used to evaluate placental function, and provide important diagnostic and prognostic information in IUGR. Ductus venous Doppler studies effectively identify preterm fetuses with IUGR that are at high risk for adverse outcomes within 1 week, independent of the uterine-artery wave form (5). Several studies of Doppler screening in the first and second trimesters have demonstrated an association between increased impedance to flow in the uterine arteries and subsequent development of IUGR (6). Although none of these techniques is diagnostic, their use in combination markedly improves the ability to decide whether early delivery is indicated -- generally when several indices of fetal well-being become non-reassuring. Examples include a non-reactive NST combined with an abnormal biophysical profile, or inadequate interval growth combined with umbilical-artery Doppler findings of reversed end-diastolic flow. The definition of IUGR as a weight below the 10th percentile for gestational age suggests a straightforward method for diagnosis by obstetric sonography: diagnose IUGR if the sonographically estimated fetal weight falls below the 10th percentile for the gestational age. Calculating the weight percentile requires three steps (7). First, a gestational age is assigned to the fetus. Second, the fetal weight is estimated. 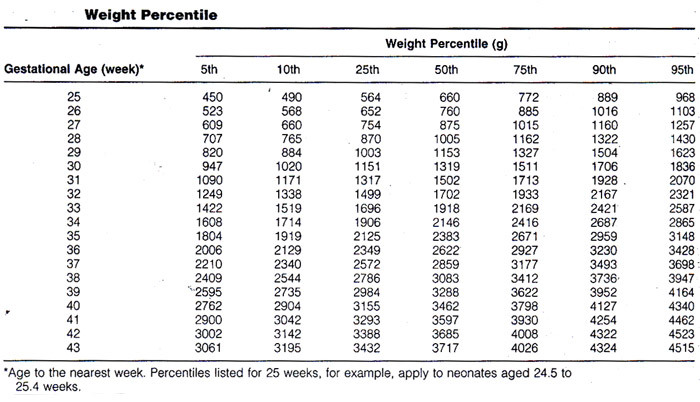 Third, the weight percentile is calculated from the estimated weight and gestational age. The three steps for this process are discussed briefly. Gestational age should be assigned at the time of the first sonogram during the pregnancy. Thereafter, the gestational age should be assigned on the basis of the initial sonographic examination as the age at that first examination plus the number of weeks elapsed since. Measurements obtained at the second or subsequent sonograms should never be used to re-date the pregnancy. Accuracy of age assignment at the initial sonographic examination becomes progressively worse as pregnancy proceeds, from ±0.7 weeks in the first trimester to ±3 to 4 weeks by the late third trimester. 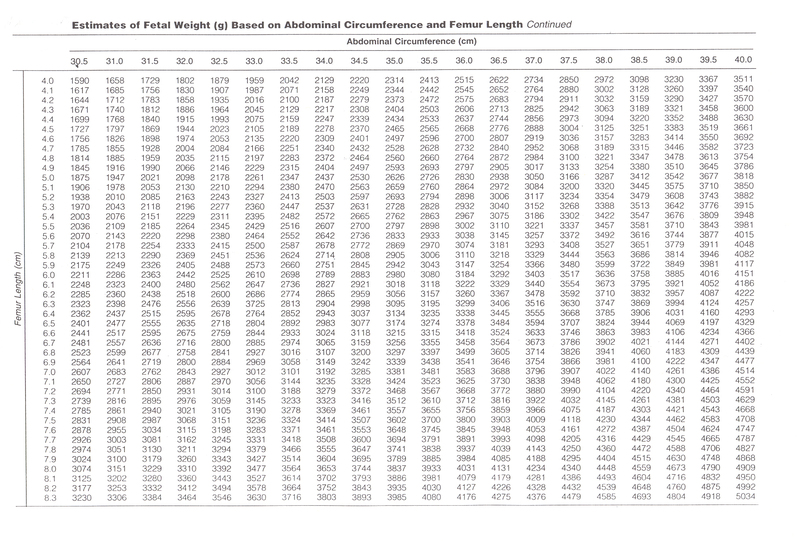 Fetal weight can be estimated from one of many published formulas that use measurements of a variety of fetal body parts. Overall, accuracy of fetal weight prediction improves with increasing numbers of body parts up to three. No further improvement in accuracy is achieved by adding a fourth or fifth body part to the weight formula. Optimal weight prediction formulas use sonographic measurements of fetal head, abdomen, and femur. Their accuracies are such that the predicted weight will fall within 15% to 18% of the actual weight in 95% of cases. The introduction of three-dimensional (3D) ultrasonography has led some authors to propose new formulas that incorporated volumetric data of fetal limbs. The application of these techniques was generally limited by the excessive time required for making volume measurements (scan and data processing) and by the need for access to a 3D machine with specific software. Therefore, such complex formulas (integrated formulas and volumetric assessment) seem poorly suited for everyday clinical practice. The study shows that most formulas are relatively accurate to assess the accuracy and characterize two-dimensional ultrasonographic formulas for estimation of birth weight according to the type of fetal biometric parameters these formulas rely on to make fetal weight projections. Most formulas are relatively accurate at predicting birth weight up to 3,500 g, and all algorithms tend to underestimate large fetuses (8). Because the causes of symmetric and asymmetric growth restriction are distinct, it is possible that distinguishing between them might provide useful information for diagnostic and counseling purposes. For example, a diagnosis of symmetric IUGR early in pregnancy suggests a poor prognosis when one considers the various etiologies. Conversely, asymmetric IUGR observed in the third trimester, particularly in conjunction with new onset maternal hypertension, carries a more optimistic prognosis with careful medical management. However, the clinician should exercise caution in interpreting these aberrant growth patterns because they may merge, as is the case of long-standing maternal vascular disease or severe nutritional disorders occurring early in pregnancy. Further, symmetric IUGR with a normal interval rate of growth may simply represent a constitutionally small and otherwise normal fetus (9). Once the gestational age and fetal weight have been estimated, the two values are assessed in relation to one another to determine the weight percentile for gestational age. This can be accomplished by using that lists the norms of weight for gestational age. Of particular importance in the diagnosis of IUGR is whether the estimated weight falls above or below the 10th percentile weight for gestational age. If an earlier sonographic examination was not performed and the patient is fairly certain of the 1st day of her last normal menstrual period, it is preferable to use this gestational age for determining weight percentiles. The straightforward approach to sonographic diagnosis of IUGR makes conceptual sense and is easy to use. However, the accuracy of this approach is limited by imprecision in both weight estimation and age assignment. In view of the limitations of the straightforward approach, a variety of sonographic and Doppler criteria for diagnosing IUGR have been proposed. The growing availability of Doppler equipment in the mid to late 1980s led to an outpouring of studies examining the use of this technique in pregnant women. Many of these studies assessed the potential value of Doppler sonography for diagnosing IUGR. The rationale for suspecting that Doppler imaging may be a useful diagnostic technique for IUGR is based on a chain of reasoning: 1) some cases of growth restriction are due to abnormalities of placental circulation such as a reduced number of tertiary villous small arteries; 2) these placental abnormalities may lead to increased resistance to blood flow in the placenta; 3) increased resistance leads to decreased velocity in the feeding arteries, especially during diastole, and to decreased volume of blood flow through the placenta; and 4) disproportionate slowing of diastolic relative to systolic flow leads to elevation of a number of Doppler indexes, including the systolic/diastolic ratio and the pulsatility index. In addition, under conditions of limited oxygen and nutrient supply, vascular redistribution that spares vital organs is a mechanism of fetal adaptation. Therefore, proposed Doppler criteria for IUGR have included elevated systolic/diastolic ratio or pulsatility index in the fetoplacental or uteroplacental circulation (umbilical artery, other fetal arteries, or uterine arcuate arteries) and decreased volume flow through the umbilical vein. In general, Doppler criteria are not as good as non-Doppler sonographic criteria for IUGR. Thus, as with non-Doppler approaches, Doppler criteria for IUGR do not permit confident diagnosis of the disorder (10). Because no single criterion is reliable for diagnosing IUGR, more accurate diagnosis might be achieved by using multiple parameters. These parameters can be used for diagnosing IUGR in two ways: one quantitative and other semi-quantitative. Previous studies have suggested that, in growth-restricted fetuses, serial Doppler measures could provide more information than a single random measurement. It is not clear why most of growth-restricted fetuses deteriorate in their biophysical profile or develop persistent variable or late decelerations and still have 1 or more normal measure. In fetuses with idiopathic growth restriction, 1) low birth weight, 2) umbilical artery reversed flow, and 3) ductus venosus absent or reversed flow are associated with in increased perinatal morbidity and mortality (11). Macrosomia is defined as a fetal or neonatal weight above a specific cutoff. The most commonly used cutoff is 4,000 g. Large for gestational age (LGA) is another term applied to a large fetus or neonate. LGA is most often defined as a weight above the 90th percentile for gestational age. The prevalence and clinical significance of large fetal size differs in diabetic compared with non-diabetic mothers. Among diabetic mothers, the prevalence of macrosomia is 25% to 42% versus 8% to 10% among non-diabetic mothers. Despite the higher frequency of macrosomia in diabetic mothers, 50% to 60% of cases of macrosomia occur in non-diabetic mothers because the prevalence of diabetes is relatively low. The most straight-forward approach to the sonographic diagnosis of macrosomia and LGA is to use the estimated fetal weight. A number of sonographic parameters besides estimated fetal weight have also been proposed to predict LGA and macrosomia: measurements of a number of fetal body parts, including the fetal abdomen and head, as well as ratio of body parts, such as the femur length (FL) / abdominal circumference (AC) and abdominal circumference (AC) / Biparietal diameter (BPD). We advocate using the estimated fetal weight to predict LGA and macrosomia in both diabetic and non-diabetic mothers. This parameter has among the highest positive predictive values when various studies are compared. It is also the most direct approach to identifying a fetus whose weight is greater than 4,000 g or above the 90th percentile for gestational age. To enhance the predictive value of the estimated fetal weight, amniotic fluid volume can be used in a complementary fashion. Specifically, when the estimated fetal weight is below the 90th percentile, LGA can be excluded with greater confidence in the presence of oligohydramnios. In an analogous manner, when the estimated fetal weight is above the 90th percentile, LGA can be diagnosed with greater confidence in the presence of polyhydramnios. Ultrasound-derived diagnosis of an estimated fetal weight exceeding 4,500 g is not as accurate as many believe it to be. Among women without diabetes, ultrasound biometry used to detect macrosomia has a sensitivity of 22-24%, a specificity of 99%, a positive predictive value of 30-44%, and a negative predictive value of 97-99%. As with clinical estimates of fetal weight, the true value of ultrasonography in the management of expected fetal macrosomia may be its ability to rule out the diagnosis, which may help avoid maternal morbidity (12). Causes of growth restriction include primary placental insufficiency; placental insufficiency resulting from maternal disorders, fetal chromosomal abnormalities, and fetal infections. Growth-restricted fetuses have a four- to eight-fold increased risk of perinatal mortality, and of those who survive, 50% have significant short- or long-term morbidity. Sonography is useful for diagnosing IUGR and monitoring the fetus after IUGR has been diagnosed. Many sonographic and Doppler criteria have been proposed for diagnosing IUGR. A multi-parameter approach using a combination of estimated fetal weight percentile, amniotic fluid volume, and presence or absence of maternal hypertension is the most accurate method for diagnosing or excluding growth restriction. The use of Doppler ultrasonography to measure umbilical artery waveform in the management of IUGR is associated with a reduction in perinatal death, and may be considered a part of fetal evaluation once IUGR is suspected or diagnosed. Once IUGR is diagnosed, an attempt should be made to determine its cause, including an evaluation of the mother for a maternal cause and a careful sonographic evaluation of the fetus, searching for evidence of a chromosomal or infectious origin. In particular, the estimated weight percentile, amniotic fluid volume, biophysical profile score, and Doppler waveform indexes should be followed up serially. A worsening trend in one or more of these items should prompt consideration of early delivery.